StairMaster draws any size single, double, triple, or multiple-landing stair you pick from the StairMaster dialog. StairMaster defaults to a multi-use variable set. You can edit, save and delete your own stair data-sets, and save the data for later use! Complete control of all materials, sizes and connections! Pan or bolted treads (even a built-in, "Custom Pan Designer" dialog). Now you can see the co-relation between multiple floors, and the minimum stair-well size for the current stair settings, and clearances between stringers, before you draw them! Check-out these 3D-drawings created from a set of StairMaster drawings. Includes: Single, double, triple or multiple landing stair systems. Multiple-stairs are drawn with an elevation & plan erection drawing, along with shop drawings of each stringer! 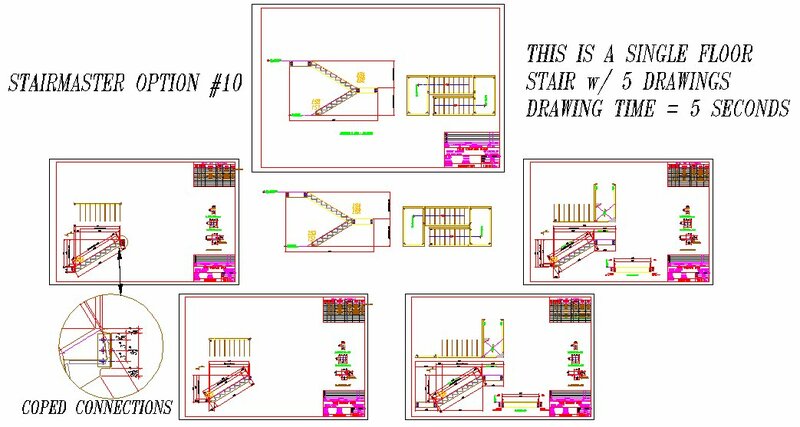 Draws stairs in an elevation, plan, and/or shop drawing.